It’s been a while since I’ve done a Hero Whipped piece and I was considering this idea and several others to liven things up. If you’ve not read one of these posts before. Since the introduction the focus has been on one character, one who appears in comics but usually in many kinds of media, including films, of course. With regards to Richie Rich there are really quite a few avenues of my return to comics, not to mention that but also the relationship between comics and film, which I can touch upon here. Before getting to a specific case study, which is where this post will differentiate itself. I’ll go through a bit of character history, as well as personal history with the character. 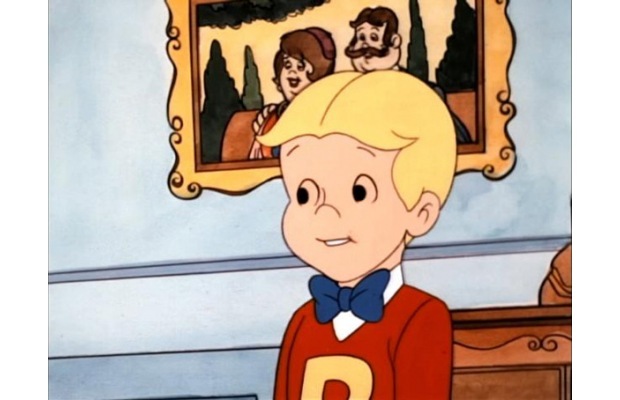 Richie Rich is one of the characters I grew up with when I was first reading comics before I abandoned them. The fate of his character and Harvey Comics was one of the hard truths I had to come to terms with upon returning to enjoying the medium after about a decade and a half hiatus. Now, he and other Harvey creations aren’t exactly dead in the water. Harvey Comics met its demise not too long after the release of the Richie Rich film. It was second major film project based on their characters and ironically, the single-issue adaptation of the film’s story was actually released by Marvel, and that’s where the case study will come in. Since Harvey went under the characters of their universe have undergone quite a journey. They were reprinted in a series of collections, most of which are now hard-to-find, by Dark Horse Comics. 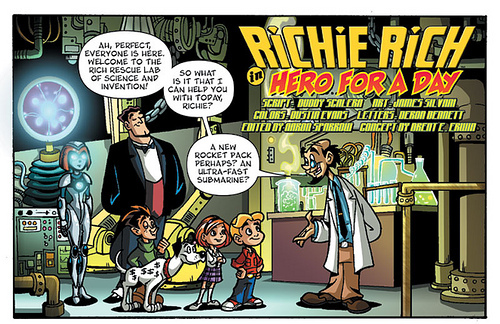 However, that didn’t last long, but Richie Rich has been revitalized through Ape Entertainment’s Kidzoic label. What Ape, with aid of the old hands that are still with us, have managed to do is that they’ve modernized the character in appearance, behavior and plot, but kept Richie’s essence the same. Through Rich Rescue he still gets into capers but the tales are more formalized and less random. He rings a bit more true but is still essentially a good kid, and not the spoiled silver spoon baby one would expect. Reggie, his antagonistic cousin, is a bit more rounded. The art is also more malleable inasmuch as there are reprints/recolorings of old tales as well as new stories with classical design of the characters. Then last year, Classic Media, which is the company that took control of the intellectual property of Harvey and a couple of other companies was purchased by DreamWorks. This development is great for the future of these characters. Firstly, it doesn’t seem like right now it’ll endanger rekindled comic adaptations (while Star Wars comics will migrate to Marvel, comics based on Disney’s characters remain entrenched at Boom Studios, and Disney has never really had a proprietary brand) I don’t foresee DreamWorks or Classic Media entering the fray either, but do believe Spielberg/DreamWorks will try and build upon his investment, and considering he was executive producer on the first Casper cinematic incarnation, other films may be in the offing. The Harvey Universe would be a prime candidate (and this could be a list at some point) for a motion capture treatment in the future. Which brings me to the specific. Before I revisited, and read Richie Rich more voraciously than I ever had before my departure from comics, I hovered around what was in part wrong with the film version. I think if I saw the film again, I’d still like it but there’d be similar issues for me. Culkin (and here may be another list ranking his films) was not necessarily the wrong choice for the part, but the part was written more to suit him than the character, there’s the occasional precociousness and snark that’s really not Richie. There’s that origin of meeting his friends where the trite envy is built in where the greedy adult world is really what’s supposed to be the enemy. Richie, his father and mother are fictitious, altruistic billionaires that are all childlike counter-capitalists in their desire to always do right over what’s profitable, yet, due to their virtue always come out swimming in money. This nuanced tonality, even with some similar dialogue and plot points comes through a lot better in a comic version of the film tale because the performances are my interpretations through reading rather than being presented a concrete interpretation onscreen. Granted some of this commentary runs counter to some of my fanboy advice, but it’s a lot easier to avoid these pitfalls when there are multiple cinematic versions to fall back on. 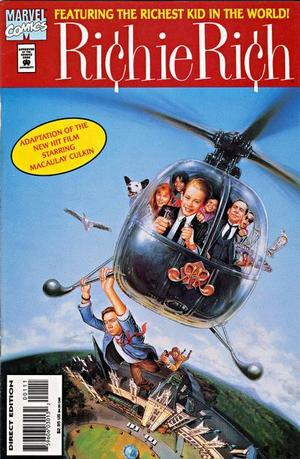 With Richie Rich there’s just this one major film and the TV show. It’s still a better more complete film than the latter TV project Richie Rich’s Christmas with David Gallagher, but a more creative dynamic with thew friends and perhaps someone like Elijah Wood in the lead would’ve worked better. With recent sociopolitical developments the atmosphere’s right for a new, more mature, dare I even say deep, handling of this character. 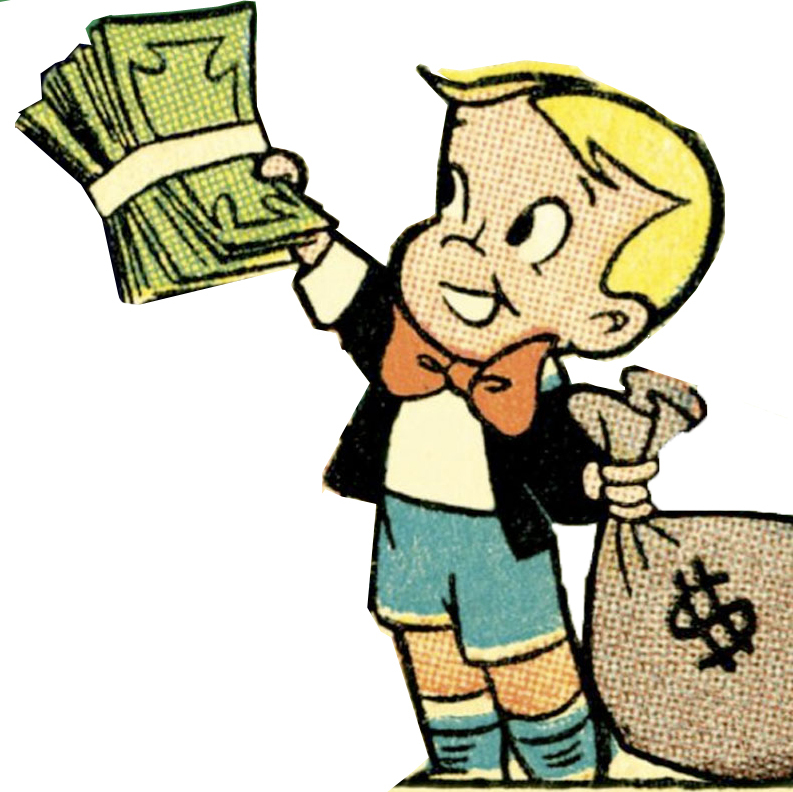 The time has definitely come I think for a screen return of some kind and a continued proliferation in comics for Richie Rich.